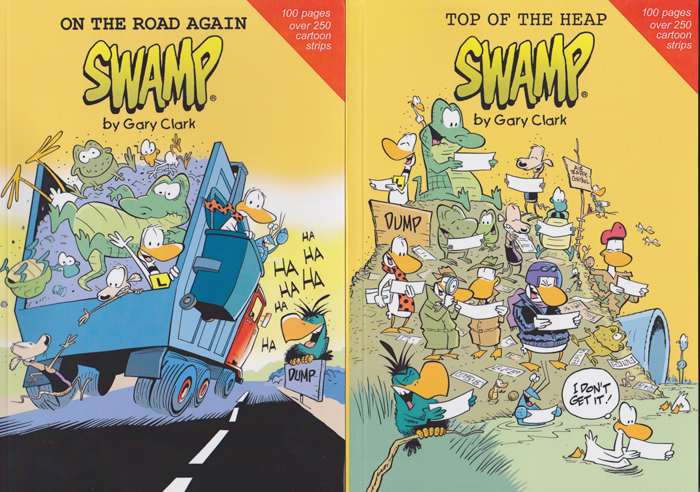 Gary Clark’s been hard at work putting together two new collections of Swamp cartoon strips for our amusement, combining current strips and a section of strips stretching back to the early days of Swamp life. 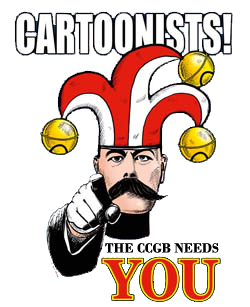 In fact, those latter strips are rather interesting (as well as funny) as Gary’s style has changed quite a lot over the the intervening years (such as the evolution of the ducks’ bills) but the gags are strong straight from the start. 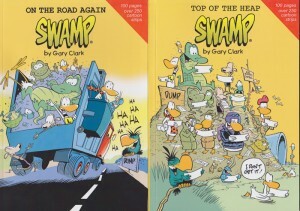 Set in an Australian swamp, the strip charts the day-to-day lives of its inhabitants as they battle with survival, learning to fly, and coping with motorcycling ducks. A favourite of mine, especially in Gary’s recent strips, is Bob Crayfish, trapped in a glass tank in a duck diner and destined to be served up for dinner, but always rather nonplussed about his situation and invariably able to find a way out of it. There are oodles of Ding Duck gags, the hopeless duck who can flap but not quite take off, much to the disappointment of his flying instructor. Meanwhile, up in the tower, the Air Traffic Controller tries to make some sense of the chaos in the skies above the swamp with varying degrees of success. The rats, Cheese and Chives, think they’re in some kind of heaven living amongst the Swamp’s dump, making the very most of what we discard, and have a rather refreshing outlook on life because of it, although they don’t seem to quite grasp where it all comes from and end up heckling someone throwing away a small portable TV for they both fancy a widescreen one. There’s lots more, from a toothless croc to a pair of frogs (one of which has a pet fly much to the other’s frustration) down to the lower aspects of life, with small snippets from dung beetles, ants and mosquitos. In one of the older strips in the collections an ant watches a golf ball almost succeed making a hole-in-one and then hurriedly pushes it to the edge of the green where his friend waits. As the golfer appears to look for his ball the first ant says, “It’s no fun watching ‘em sink the easy ones”. 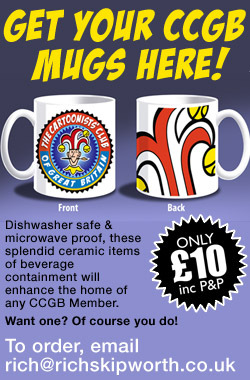 Swamp’s become one of my absolute favourite cartoon strips, and if you’ve not discovered it yet you really should.